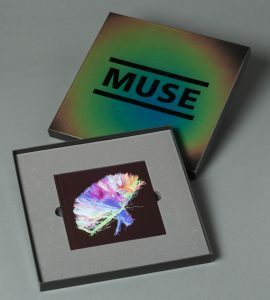 Muse wanted a creative solution for the cover of their album ‘2nd Law’, a deluxe box set, which would also reflect the second law of thermodynamics, as referenced in their album title. As heat sensitive packs have been previously manufactured as an artwork reveal mechanism, LCR worked closely with Brighton based packaging company Modo to create something impressive in the form of bespoke packaging that would be suitable for this exclusive box set. By using Liquid Crystal Ink, we were able to create a dramatic effect as a laminated box wrap. 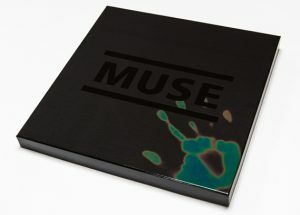 A detailed ink and paper sampling process saw dozens of prototypes of different print and laminate combinations to get a unique result from flood-printing art paper, (which wraps the board the box lid is made from), with Liquid Crystal ink, before a final gloss lamination. 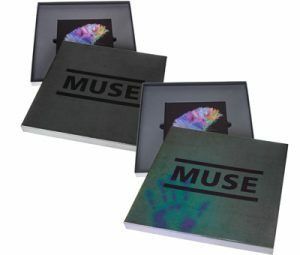 The design was featured on Creative Review but for a closer look, watch either of these album package reviews; MUSE 2nd law deluxe box set unboxing and Muse the 2nd Law deluxe edition.